The Bolle SLAM Safety Glasses have a modern design, with excellent fitting, to provide both protection and comfort. The spectacles have a wraparound fit to provide a panoramic visual field. The lenses have an anti-scratch, anti-fog coating and the arms feature comfortable temples. 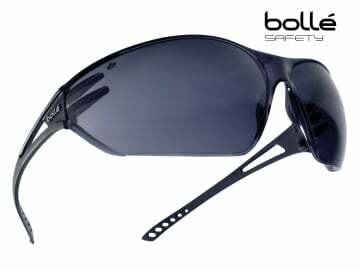 These Bolle SLAM Safety Glasses have smoke colour lenses. They are approved for permanent wear and certified with perfect optical quality. Designed and used for protection against UVA/UVB and solar radiation, 99.9% UVA/UVB protection. Lens Type: Smoke, Anti-Fog and Anti-scratch. Lens Conforms to: EN1661F/EN172-Solar 5-3.1.